"Forget what sound is and music becomes visible." I am a professional trombonist and a specialist in brass pedagogy. For over 20 years I have strongly advocated student participation in music in the schools. I believe a student's involvment in music and in the arts is critical to a well-rounded education. Music & Arts also shares this philosophy and I am excited to be part of the professional team here in south Austin. I am a member of the Texas Army National Guard 36th Infantry Division Band based here in Austin and I teach trombone, euphonium, and tuba to middle school through college and professional musicians in the greater Austin area. My bachelors degree is from the University of Texas at Austin where I performed in the UT Wind Ensemble, Symphony Orchestra, and Trombone Choir. I was also head trombone section leader in the UT Longhorn Band. 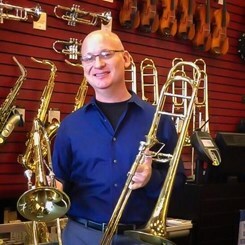 My trombone teachers include Donald Knaub, Nathaniel Brickens, David Jackson, and Roger Winslow. I received my masters degree in conducting from the University of Michigan where I studied conducting with Micheal Haithcock. While at Michigan I was a teaching assistant for the Wind Ensemble and the Michigan Marching Band. My musical experiences also include marching in the Cavaliers Drum & Bugle Corps and then later teaching on the Cavaliers brass staff. I played professionally with the United States Air Force Band in Washington, DC, the San Antonio Opera as well as many numerous regional orchestras including here locally as a sub with both the Round Rock and Austin Symphony Orchestras. If you have questions about anything related to Band & Orchestra please don't hesitate to ask!